Christian Coleman headed to the city of Clemson, South Carolina, in the middle of January wondering “where he was at” following a hard winter of training and preparations for his season opener. It didn’t take long for the world to find out. In his preliminary heat at the invitational event, the 21-year-old ran a world-leading 6.45 for the 60m, equal to his personal best and a time many sprinters would be delighted with. He followed that up, however, with a scorching 6.37, seemingly lowering Maurice Greene’s world record of 6.39 which had been set in 1998. Though Coleman’s mark would remain unratified due to the absence of electronic starting blocks, the performance went far from unnoticed. Had it been a fluke? Could he run that quickly again? His next meeting, in Boston, saw him clock ‘only’ 6.46 for victory. Then, however, came the US trials for the IAAF World Indoor Championships. Yes, they took place at an advantageous altitude in Albuquerque but when Coleman eased down on his way through the heat in 6.46, it was clear something remarakable might be in the thin air. In his semi-final he lit the touchpaper with 6.42 before the fireworks really went off when he charged his way to victory in the final in an astonishing time of 6.34. In terms of a signal to send out to the competition ahead of the World Indoors, Coleman could not have delivered anything more emphatic. He is now the undoubted favourite to land gold in Birmingham. Whether he can do so in yet another record-breaking time remains to be seen. Greene is convinced the man who ran the quickest 100m on the planet last year (9.82) can, particularly given he had a sluggish start in the Albuquerque final, while Coleman himself certainly isn’t about to shy away from any challenges coming his way. “I don’t really look at it as any pressure, I just embrace it,” he says. “I love the track, I love racing, I love competition, I love pushing my limits, I love doing special things. “Now a lot of people are going to be watching, a lot of people are going to be wanting to race me. I’ve got a target on my back but I love that and I love racing the best competition, on the biggest stage, with lots of people watching. For such a young man, there is an evident maturity to Coleman to go along with an understated confidence and a general feeling of being able to take everything in his lightning fast stride. For example, there was a particularly philosophical way of looking at his unratified record in Clemson. He chuckles with the last remark, betraying his relaxed mood as he looks forward to what lies ahead on his return to the UK. Last summer in London was a revelation to Coleman in many ways. It wasn’t just the playing to a packed house, or that the crowds were so knowledgeable about what they were watching. Coleman might be one of the best in the world at what he does but he is largely anonymous to an American public whose minds tend to zone in on other sports. “A lot of people recognised me (in London),” he adds. “I didn’t expect that at all because I don’t really get recognised at all at home. We just have to continue to push the sport forward, hit great marks, do great things and show that as athletes we’re just as good as those playing the top sports in America, like baseball, football and basketball. Being recognised at the world championships may have taken a little bit of getting used to, yet competing in his first global final simply felt like the next natural step after a college career which brought numerous NCAA titles, both indoors and out. “It was a huge blessing to get that far and to compete on the world stage, but it wasn’t a shock or a surprise at all,” says Coleman. “I wasn’t that nervous, it was more a case of being excited to showcase my talent. I definitely felt like I belonged. I worked so hard, if not harder than anybody, to get to that point and I wanted to seize the opportunity. in front of you and, no matter how many times you’ve been in a race like that, you always feel the atmosphere and pressure of that moment. That moment brought a silver medal as Coleman finished just behind world champion turned pantomime villain Justin Gatlin and just ahead of the legendary figure of Usain Bolt. Many feel the young American is now the heir to the Jamaican’s crown and is capable of challenging the outdoor world records which the finest sprinter ever to grace a track has etched into the history books. Those are big spikes to fill and it’s worth noting that Bolt was unofficially timed at 6.31 for 60m during his 9.58 100m in 2009. Coleman, however, insists his focus will not rest solely on what the clock reads. The crowds which will pour into the Arena Birmingham could well be treated to something special. 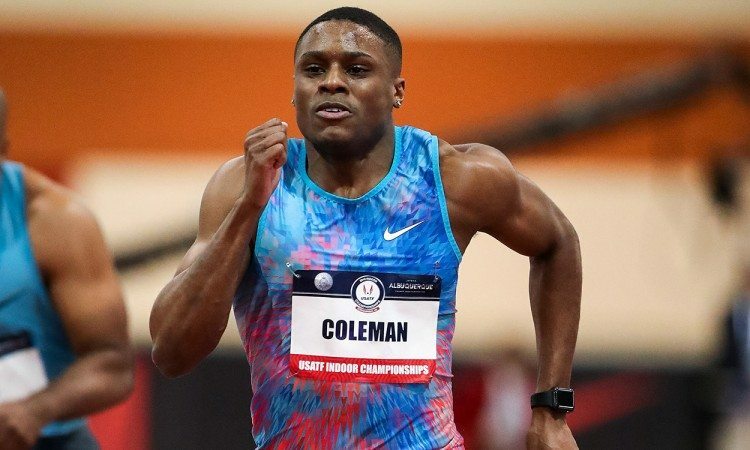 Ask Coleman for the identity of those he expects to threaten his chances of taking gold and he cites fellow American Ronnie Baker, a narrow second in 6.40 at the American trials, and China’s Su Bingtian as serious contenders. He is also acutely aware of the strength of the current crop of British sprinters, having been part of the USA squad which finished second to the host nation as they so spectacularly took world championships gold in the 4x100m relay last summer. “They are guys with a lot of talent and I think they are going to be right there ready to compete alongside me as the years go along,” adds Coleman. “I know Nethaneel Mitchell-Blake well from when we raced together in college and he’s going to be one to be reckoned with over the 100m and 200m. CJ Ujah has been doing it for a couple of years now, too, and I think it’s going to be a good challenge for us in America doing the 4x100m. They’ve got guys coming up with a lot of talent and I think we do as well. 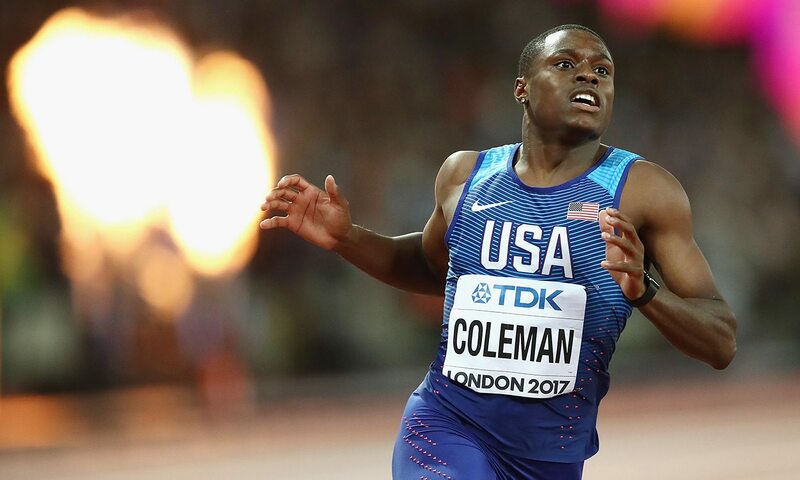 Bolt’s retirement has opened the door on a new era in men’s sprinting and Coleman has undoubtedly been one of the first to step through into it. “It’s really exciting to even have my name mentioned in that conversation about being able to be one of the top guys in the whole sport,” he says. “It’s an honour and I’m looking forward to what’s to come – competing with the other guys and stamping my name in the history books. I don’t even know how to describe that feeling of being talked about as one of the next guys to take over the throne – it’s pretty crazy! “I’ve been putting in a lot of work over the years, it’s coming together and I’m reaping the rewards of that work, how I stay true to my craft, and I think it will pay off over the years. “To go to London and come away with two silver medals lets me know that I have the skills and the capabilities to compete at that level against some of the top guys in the world. Now I’ve made a name for myself going forward.